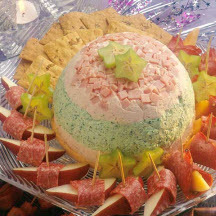 Looking for festive menu ideas and foods for a New Year's Eve party? You'll find them here! Now all you need to complete the celebration are the funny hats and silly noisemakers! A terrific martini for holiday late-night celebrations. 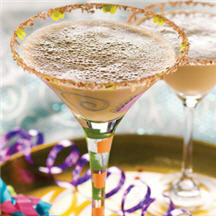 A chocolate-rimmed glass and a hint of coffee liqueur add a twist on flavor and a festive flair. 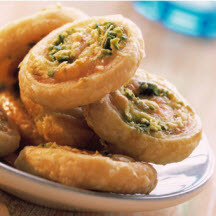 These crispy mini party tarts are filled with the good stuff — like pistachios, the little green love nut, and salmon which is rich in omega 3 fatty acids. This colorful molded torte serves a crowd, looks quite elegant on the hors d’oeuvres table, and is easier to make than it looks.